As Christian wives, we probably believe that we are incapable of plucking or tearing down our homes. We immediately want to believe that we are the women of wisdom that's mentioned in the first part of this scripture as opposed to the foolish one mentioned in the latter part. However, without realizing it, most of us fall into the foolish category. That may be a hard pill to swallow, but the statement is true in most cases. This isn't because of immaturity, selfishness or wrongful intent; but mainly because of the lack of knowledge. As Christian wives that attend church on a regular basis, we all want to believe that we are the epitome of what a Christian wife is supposed to be. We think that if we can master cooking, cleaning and ministering to our husbands' physical needs, then we have mastered wifehood. Being the Christian wife that God intended requires so much more. Of course, all of the characteristics mentioned previously are important, but accepting the mantle of a Christian wife is not something that can be accomplished over night. Most of us are introduced to the basics from our mothers and grandmothers who taught us how to hem a pair of pants and baste a turkey. Nevertheless, the real teaching comes from God and the Holy Spirit. As we become wives, one of the first lessons that God begins to teach us is that you are no longer (in a spiritual sense) considered separate "individuals". God sees you as one. Just as your limbs are an extension of you, after you become married, your spouse becomes an extension of who you are. As a single person, you think for yourself and your decisions and actions apply to and affect you as an individual. However once you marry, your decisions and actions affect your spouse as well as you. Spiritually speaking, you and your spouse become Siamese twins. Just as Siamese twins in their natural form have to consider their other half, we as married couples must do the same in our union. We have to envision ourselves with two heads, but one set of arms and legs. We have to live as if we share one heart. Therefore when we do things, we have to think in a sense that it will affect our spouse just as it would affect us. 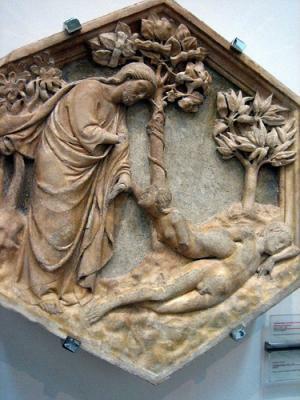 When Eve was presented to Adam in the garden, Adam then declared that Eve was bone of his bone and flesh of his flesh. Although you still have your own individual mind and bodies, you now are to think and operate as one. Unfortunately many married couples today settle for "just being married". However, there is more to a successful Christian marriage than just the ability to stay together for a long time. Many couples manage to stay married, but they frequently live in chaos and negatively charged atmospheres; not allowing God in truth to intervene and show us how to bring harmony to our marriage. Those unions often lack true harmony, understanding, respect, compassion and sometimes passion. Many people refrain from getting married because they feel as if they don't want to be tied down to just one person. Some feel that they don't want to have to answer to another individual. They don't believe that being married is something that can bring them real joy. The state of a cleaved union does not mean that there will not be disagreements, attitudes and the days will always be filled with fun and sun. Allowing God to take marriages into a cleaved state provides a consensus to live in matrimonial bliss. 23 For the a husband is the head of the wife, even as Christ is the head of the church: and he is the savior of the body. Think about your marriage and what things you wish could enhance it. Taking into account how long you've been married, do you feel as if you are truly "one" with your spouse? Father, in the name of your son and our savior Jesus Christ, I ask that you open the heart to those that are following this study. Bring us to the understanding that the blood covenant of marriage that you ordained is not stronghold or a form of punishment, but it was created to bring you glory. I commend you for wanting the Godly man in your life who will be the spiritual leader in your home. I had prayed for years that God bring my husband to this point where we prayed together, was committed together in going to church and serving God and would study the bible together. September 14, 2011 my husband had a heartattack and was rushed for an emergency triple bypass. From that day forward he has stepped up and been that spiritual leader, one thing i must tell you. You absolutely must be ready and FULLY prepared for what God has in store because your husband will become your accountablity partner, meaning when you fall short, there is correction, within bibical principles. God revealed this to me just last week. There is ALOT of stress going on in my life and when it piles up i fail God terribly. My husband will state, you aren't acting very Christ like right now, or something similiar which further aggravated me more. He was holding me accountable to stand strong in the face of adversary and i wanted to bash him for it. God gently spoke to me and told me that he did exactly what i prayed for, he answered my prayer, did i not realize there was more to it than just bible study and praying together? Great wake up call for me. So i just wanted to encourage you sister, that God hears your prayers and will answer just know that you will get so much more than you will expect or even ask for. You have to take the good with the bad but in human, womanly eyes we only want what "we" think we need, not the "ouches" that are there to help us grow also. Just wanted to say that all though there is so much going on in the world my faith stays in Jesus. Sometimes it's hard not to get caught up in what's going on especially when my kids come home and talk about their days. But I thank God that we know the truth and that we can rest in Him. Romans 8:38 For I am convinced that neither death, nor life, nor angels, nor heavenly rulers, 42 nor things that are present, nor things to come, nor powers, 8:39 nor height, nor depth, nor anything else in creation will be able to separate us from the love of God in Christ Jesus our Lord." To God be the Glory this is a Great teaching I know that my husband and family is saved because i am save and filled with HIS HOLY GHOST. It gets hard to continue to stand when your spouse don't acompany with you to church he says he believe in God, But he don't show it by attending Church. It's hard being part of the Ministry and your spouse is not supported. I wonder sometimes Keep me in your prayers. I really enjoyed reading this it was very helpful. However as I read some of the post that were written it made me think of a book that I just finish reading called Created to be his Help Meet. It was written by Debi Pearl and I would strongly recommend that you read the book. It has changed my out look on marriage and made my realtionship closer to both God and my husband. You can find this book on their web page nogreaterjoy.org I wish all of you the best and please let me know what you think! We also praise you Lord that my wife no Longer has temper outburst. We praise you for victory in this area! I love my husband but I love God more...My husband loves me or so I hope he does but I dont know if he loves God as he should. I wish that we can pray more together and have Christ as the center of our relationship. I wish that we could read the bible and talk about it and its funny because we both serve God together in music ministry. I have been through a lot with my husband. When he was struggling with drug addictions, I was there for him and it was HARD. I lost all trust in him and although I say I trust him, deep inside I see that I don't and it drives me crazy. I don't know what to do anymore...sometimes I feel like he does not love me or like he is doing things that he should not and I don't know if it is me being paranoid because I have been hurt so much or what. So I just ask for prayer becauase I know God answers the prayers of the faithful. God Bless! I'm interested in knowing more about who should handle the money. How to be a submissive wife and have a career. In 24 yrs of marriage (christians) we have our biggest fights over money. that's about the only ongoing fight we have. He has a hard time even discussing it. He tells everyone that he handles our finaces because I get too worried about the bills, but that's what I let him think because he's so touchy about it I don't want to deal with it. But I feel like a child in my own(his) home. I don't own anything. I can't pay for anything. I started a Real Estate business last year and I love it but I dread making money and handing it over to him. He's great with the bills and we have excellent credit because of this. But I feel out of control. I have always had to be very careful because I never know what is in the bank or credit limit on cards, anything. I feel so stupid. Help. I have been married for only four yrs. Me and my husband have been through so much he is a p.k. and that alone has brought many challenges. But it seems as if we are very different people now. Yes, I choose to stay through all the madness and so did he, but I am afraid my passion for him has left. I look at him more like a child then a husband we have five kids and I just feel so alone. I am always at home with the kids and he barely is ever around. La'Wanda thank you for taking the time in creating this online bible study. It was an inspiration to me. I was able to understand my role in becoming the wife God has called me out to be. Marry someone elses former spouse and you will soon find out why thay were available. That was a great lesson. A far as submitting...When a women marries, should or must she leave her church and attend her husbands church? thank you because my husband and i are getting back to gether and i need someon to teach me how to be a wife but I have a question what does it mean to submit? i have tryed to look it up but it seems like it has been taken out of the vocalubaly of to day I have to do my best this time/ one last question can a woman regain respect for her husband? if so how? I am so glad that I tok the time to read the reminder as to what is still and always means tobe kept in the word. As we have been married for almost 18 years,this was a good lesson. Hi Barbara, in reference to your question, this situation is so common. However, 1 Corinthian 7:13 tells us 'And the woman which hath an husband that believeth not, and if he be pleased to dwell with her, let her not leave him. 14 For the unbelieving husband is sanctified by the wife, and the unbelieving wife is sanctified by the husband...1 Cor 7:13-14 (KJV). When we deal with unsaved/backsliden spouses, we are still expected and commanded to live, love and do what is right and acceptable in the sight of God; even if the unsaved spouses'salvation is one of convenience. There is an old cliche that states, "actions speak better than words"; this is very accurate. Our unsaved spouses can be won better by our actions and attitudes. 1 Peter 3:1 Likewise, ye wives, be in subjection to your own husbands; that, if any obey not the word, they also may without the word be won by the conversation of the wives; 2 While they behold your chaste conversation coupled with fear. Disobedient or unsaved husbands are to be won over by our behavior. Stay true to God in your thoughts, words and deeds coupled with fasting and continued prayer. Continue to fulfill your "wifely duties" and watch God work. or anything .He is very controling and makes me feel bad most of the time.So please help me understand what is the role of wife with unsaved husband. I never knew! Thank you so much for such a thoughtful and powerful reminder. Keep up the good work. This article is a true blessing! I know that, personally, as I was reading it, it reminded me of the oneness that my husband and I share. The example of the Siamese twins really brought home how much all of my actions truly affect him. ["Taking into account how long you've been married, do you feel as if you are truly "one" with your spouse? I feel blessed to be able to say that yes, I do feel that my husband and I have truly become "one". Of course no marriage is perfect, but, through the guidance of the Holy Spirit, we have been able to grow closer year by year. I can honestly say that it has been our trials that have brought us closer together. We have been through several deaths in the family, severe health battles, financial challenges, and more. During each challenge, we had the choice to either grow closer together or further apart. We chose to allow God to use those trials to bind us closer together, and He has truly done that. This article will be a blessing to any woman that read it, apply it and share these truths with other women. I'm so grateful that the Lord is in control of my marriage of 20+ years. It's a lie from the enemy, that Christian marriages can't have passion, ecstasy and joy in their union. Let’s be real about it, it will sometimes rain down heartache, misunderstanding and a few verbal fights. However, love and wisdom is a bridge back to peace and harmony. Join in and write your own page! It's easy to do. How? Simply click here to return to La’Wanda D. Cook's Entry Form.